Lately I've been making a thick, cumin and coriander-spiced root vegetable stew. It's a free-wheeling one-pot dinner that attempts to use up whatever winter vegetables I have lingering about, and provides leftovers for a day or two to come. I'm not entirely sure what to call it. A curry? A korma? Either way, I took some to my sister's recently, and she asked for the recipe. Heather, here you go :). We can make it the next time I come over if you want. xo. There's quite a bit of chopping involved, but a big pot of goodness is the reward. In the version I made for her, I used potatoes, cauliflower, and then a bit of tofu for protein and substance - but other times I trade in carrots, or parsnips, or shredded cabbage. 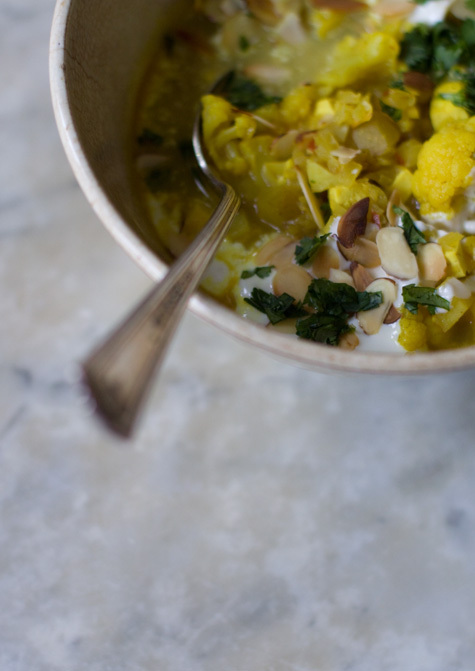 I use a yogurt/cream blend here, which is inspired by Indian kormas, but there is no reason you couldn't substitute coconut milk for that lux-y creamy component. You can prep a lot of this ahead of time to make it a more week-night friendly. For example, go ahead and measure out the spices ahead of time, and keep them in an air-tight container. 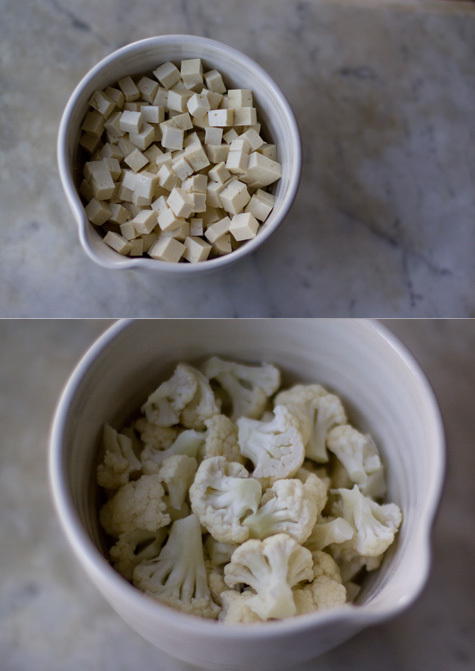 And go ahead and chop the onions, ginger, cauliflower, and tofu a day or two in advance if you like. But if you cut the potatoes early, keep them covered in a bowl of water to keep them from browning - you can cut those a day or so in advance as well. HS: One shortcut, you can use a food processor to chop the onions. And like i mention up above, while I used potatoes and cauliflower here, you can add or swap other seasonal vegetables. For example: chopped or sliced green beans, parsnips, broccoli, zucchini, etc. You can also certainly play around with different spice blends or tweak the ratio of spices to your liking. This one isn't particularly hot-spicy. Combine the cardamom, turmeric, red pepper flakes, cumin, coriander, and cinnamon in a small bowl and set aside. 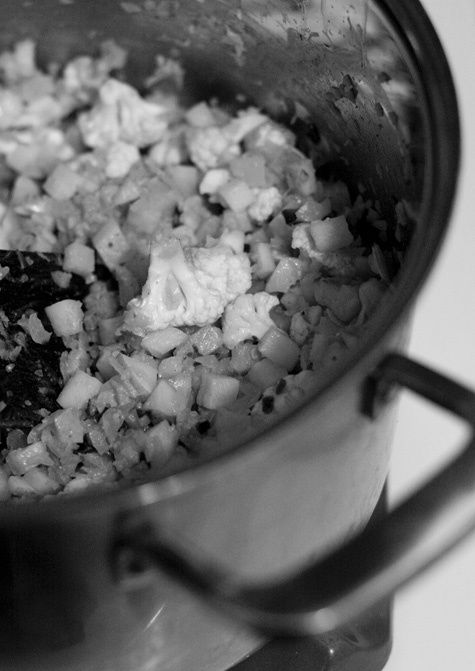 Heat the butter/oil in a large, thick-bottomed soup pot over medium-high heat. Stir in the onions. Cook until they soften a bit, just a minute or two. Then add the ginger and then garlic. Stir in the spices and continue cooking for a couple minutes, or until the spices are very fragrant. Stir in the potatoes, cauliflower, and half the almonds. Add 3/4 teaspoon salt. Now stir in 3 cups of water. Stir gently, cover with a lid leaving a tiny crack and simmer for 15-20 minutes, the potatoes should be just about cooked by then. Taste, and add more salt if needed. Stir in the tofu after about 15 minutes so it has time to heat through. In the meantime, combine the yogurt and cream in a bowl with a couple pinches of salt. Once the vegetables are cooked through, dial down the heat to low. Now, you can add the yogurt mixture all at once and bring the pot back just to the brink of a simmer. Or do what I do, serve the yogurt on the side, so people can make their bowl as rich as they like. Either way, taste, make sure to taste the broth, and add more salt if needed. If you haven't added the yogurt to the big pot, serve each bowl with a generous dollop of the yogurt cream, and top with the remaining nuts and chopped cilantro. Cauliflower tastes great like this. Imagine a skillet of caramelized onions cooked down with fragrant cumin, ginger, garlic, sesame seeds and chiles. Add cauliflower and cook until tender. Vibrant, spicy, sweet earthiness, all on one plate.